If you've been paying attention lately, you've probably noticed an increase of succulents, air plants and terrarium ideas in advertisements, store displays and magazines. Gardening, both indoors and out is becoming a popular pastime and hobby. After seeing several terrariums, and thinking how cute they were, I got a few friends together to make some of our own and share our results. The February issue of Family Circle Magazine had some really simple instructions to get us started. First of all, pick a container. You can use an open-top glass container or one with a lid. Just keep in mind which type of container you're using when you are selecting your plants. It's also good to know the dimensions of your container - you want to select an array of small foliage plants (tall, small, bushy, etc), such as ivy or button ferns, that fit in your container. We went to a local garden center, Primex, that offers classes on Terrariums. The benefit of going somewhere like this is personal help from knowledgeable people. You may spend a little more for your supplies so keep that in mind as well. Once you have a container, you can pick out plants and any decorative items you may want to include with your terrarium. Grab some charcoal, dirt and rocks if you choose, and then it's assembly time. 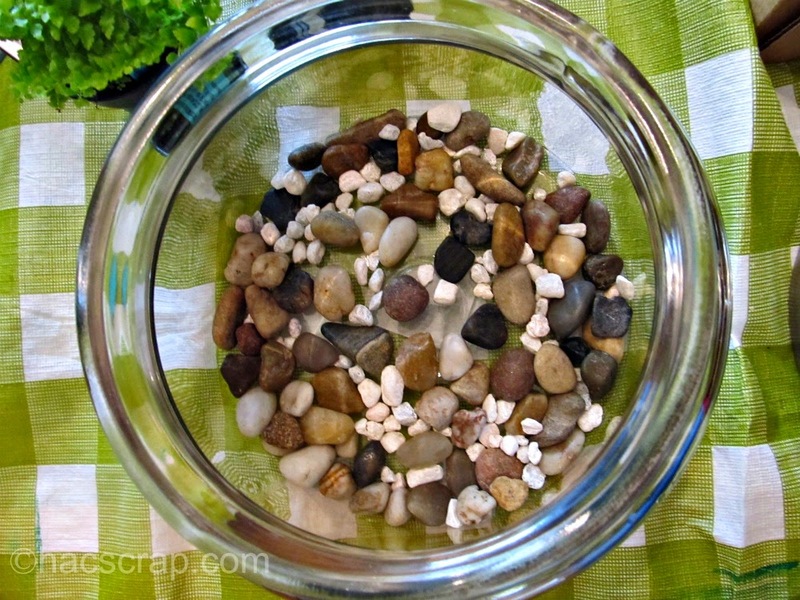 If you choose, lay down a layer of rocks, gravel, stones, etc. This is mostly a decorative step, but can be used for drainage in certain circumstances. I used a combination of small stones and white gravel. Your next layer is a thin layer of charcoal. 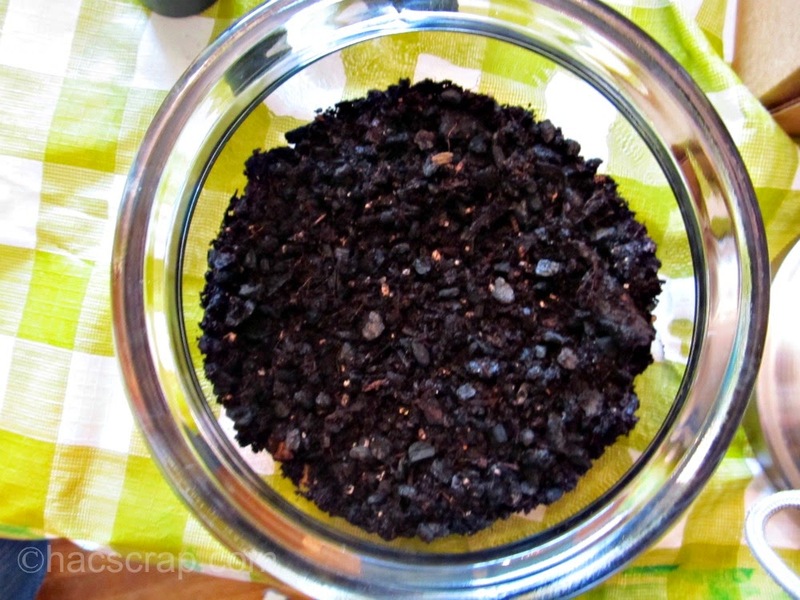 The expert at Primex suggested horticultural charcoal rather than aquarium charcoal, but an Internet search provided instructions using both. You next layer is dirt. I put a very thin layer of dirt, then arranged my plants, and added dirt as needed to cover the plant roots. Don't crowd your plants - they may be tiny but they will grow. You can choose to cover your soil with moss if you'd like. I didn't want to crowd my container, so I just used my three plants, a few rocks and a little blue pot turned on its side. You can add any decorative items that you'd like (you can get really creative here using Lego figures, rocks, toys, buttons, etc). Or you can just leave it with plants. 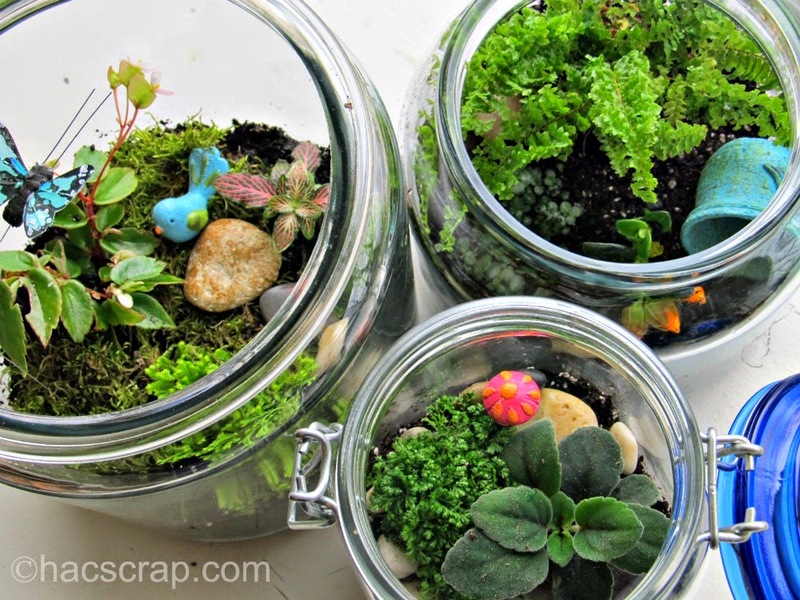 Terrariums can be a great way to bring your garden indoors and enjoy them all the time. You can place your terrarium in indirect light, and when the soil feels dry, give it a mist or add 1-2 ice cubes to water it. We each did something a little different, including different plant and different decorative items. Diane used a tall glass mason jar she had on-hand and added a cute little mushroom. 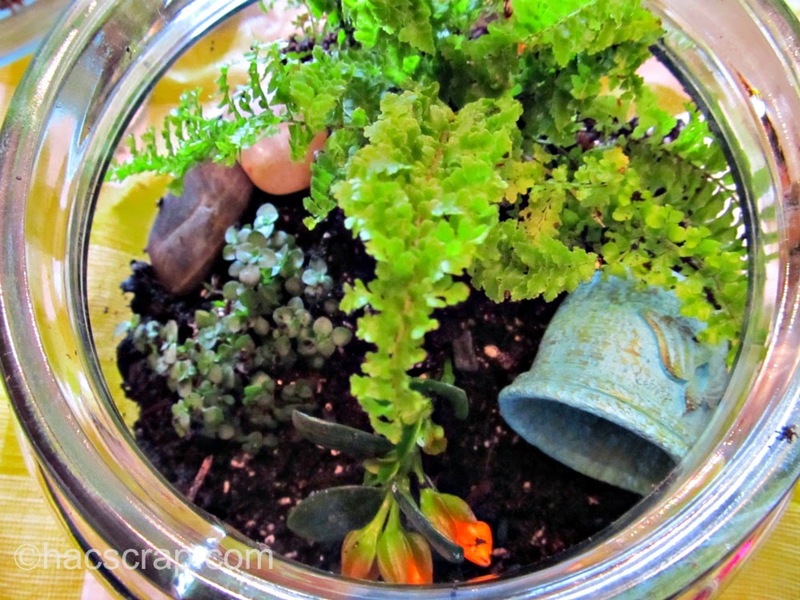 Sherry used a glass apothecary jar with some adorable garden accents. 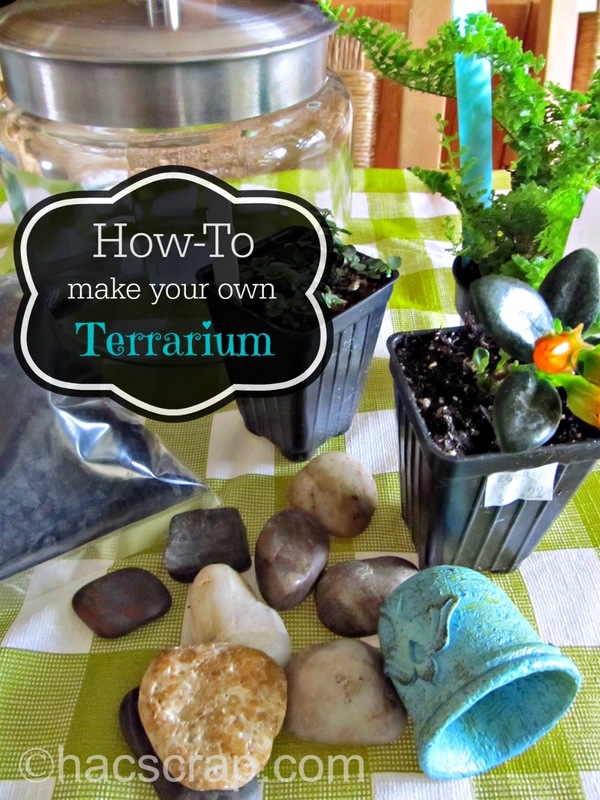 What kind of terrarium will you make? Happy gardening! First LOVE YOUR NEW SITE! I can't believe I missed it :) I've always wanted to make my own Terrariums as I think they would be great for a bedroom or bathroom. Thanks for inspiring me! Your site looks AWESOME! I love the terrarium project, too! I made one years ago for a 4-H State Fair project. I would love to make one with Gabe now. I'll have to use this for inspiration. Beautiful! Love the touch of turquoise!